Conveniently located near the airport, railway station and the Palexpo Exhibition Centre, not quite 15 minutes from the centre of Geneva, the Mövenpick Hotel Geneva is the perfect place for business and leisure travellers. Spacious and calm, our newly renovated rooms are equipped with individually controlled air-conditioning and heating, direct-dial phone/voicemail, Wireless LAN, modem connection, hairdryer, minibar, coffee and tea-making facilities, iron and ironing board, and separate working desk with lamp. Mövenpick Hotel and Casino Geneva is a paradise for gourmets, where international and Swiss specialities are served.Our main restaurants are open daily, serving breakfast, lunch, dinner and snacks.Treat yourself with sushi, sashimi and teppanyaki in our Kamome Japanese restaurant.At the end of a busy day, you will enjoy socializing at the Alibi piano bar.For banquets, conferences and seminars, 19 adjustable rooms can host up to 800 persons in cocktail style, in about 1,250 square metres. All essential performing equipment and technical assistance are available. Logistics, technical aspects, entertainment and decoration are all organised by our event team, who will also help you find the ideal location for your event. Welcome to the most international city in Switzerland. 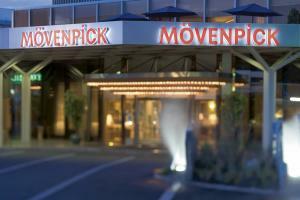 Thanks to its central location with excellent transport links, the Mövenpick Hotel & Casino Geneva is the first-class address for discovering this beautiful city on Lake Geneva and for business events of all kinds.For banquets, conferences and seminars, 19 adjustable rooms can host up to 800 persons in cocktail style, in about 1,250 square metres. All essential performing equipment and technical assistance are available. Logistics, technical aspects, entertainment and decoration are all organised by our event team, who will also help you find the ideal location for your event. The perfect venue to welcome 2 to 600 guestsFor a private or a business event, for a luncheon or a gala dinner, the hotel is the perfect venue for your receptions. From the kitchen to the service, the florist or the entertainment, our team will pay close attention to your needs in order to make your event a success.